Welcome to the Log Cabin at the lake. Serenity and privacy is all yours. Only a 15 minute picturesque drive from beautiful Palmer located in the Matanuska Valley. 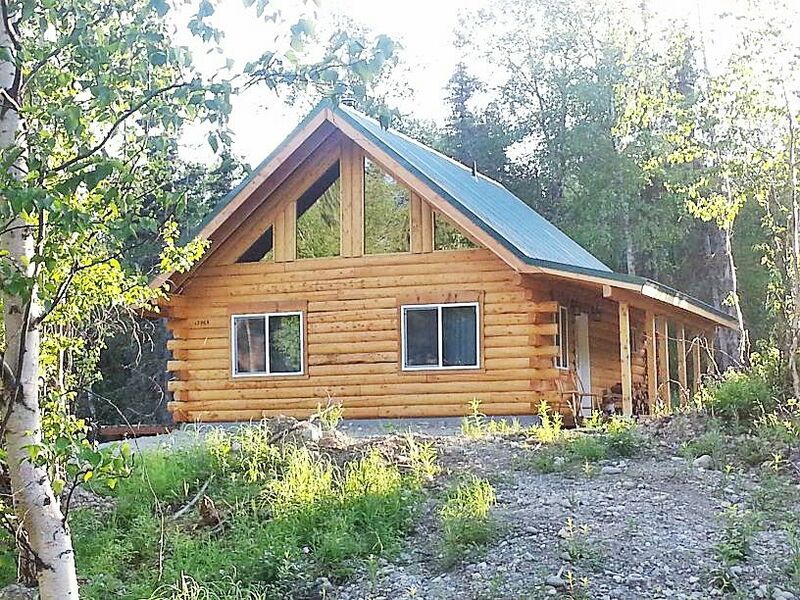 This is a new and contemporary log cabin built by one of Alaska's premier log home builders that sits on it's own private 1.25 acres in a small lake community. This is not in a cramped tourist area, here you get to enjoy Alaska like an Alaskan yet you are only 1 1/4 hours from Anchorage. But don't think you're sacrificing connectivity for the rustic life, the cabin is equipped with all the modern amenities of home including high speed internet, telephone (with free nationwide calling), Sling TV on a brand new 50" 4K UHD TV with movie channels and many premium programming choices. ROKU to enjoy streaming your favorite Netflix or Hulu subscriptions. Bluetooth Speaker which works with most mobile devices, radiant in-floor heating and of course a wood stove for those cozy nights in front of the fire. Be one of the first to stay and enjoy the zen relaxation of this home. There is a loft bedroom with his and hers closets and a beautiful view, queen bed, dresser and nightstands. Downstairs in the great room, one comfy queen Futon that sleeps two and a Simmons Beautyrest foldaway bed for those extra guests. The kitchen is modern and well equipped with a large french door refrigerator, dishwasher, full size stove, built-in microwave, toaster, coffee maker. Kitchen has all utensils and cookware. The dining area is spacious and comfortable, seats 6 and affords patio door access to the large open grilling deck with chairs, small table and BBQ Grill for enjoying the Alaska outdoors. There is a full length covered porch at the front of the cabin with Adirondack chairs and table for relaxing and watching the occasional Moose. The bathroom is large and modern with full size bath and shower. The cabin also has a modern washer and dryer with laundry items supplied. If fishing is your passion, you are only a five minute stroll to the lake. We even supply poles and tackle. There are two golf courses just 15 minutes away that are surrounded by spectacular mountain vistas. Groceries, gas, churches, restaurants and bars are also only a short ten minute drive to Palmer. Wasilla is just twenty minutes by car and has all major shopping including Target, Home Depot, Lowes, Walmart, Sears, Fred Meyers, plus a host of local stores. The famous Iditarod sled dog race begins in Wasilla every year. Just outside Palmer are Musk Ox and Reindeer Farms and Tours. Hatcher Pass is also close by and affords some great skiing in winter and hiking in summer. Both Anchorage city center and the Anchorage International Airport are an easy one and a quarter hours drive away. There is simply nothing like a true log cabin experience. We call it the 'zen cabin' because of the calming effect you will feel as you walk through the door. Log homes are living breathing things and you truly feel at home and relaxed here. You will enjoy the best nights sleep of your life, no noise and you can literally hear a pin drop. One Full Bathroom. Full size bath and shower. Vanity Unit. Full size washer and dryer. 17 Mile Lake is nestled among mountains and large granite monoliths that look down over the lake. Located only 10 minutes from Palmer, a beautiful town located in the Matsu Valley. Located at 17 Mile Lake. This is a picturesque Lake Community. 17 Mile is a large lake that affords fishing , hiking and boating in the summer. Ice fishing in the winter. View Of Granite Hills, really rugged and beautiful. Spices and condiments, jams, jellies etc. There is an AM/FM Radio and also a Bluetooth Speaker that works with most mobile devices. jigsaw puzzles and various board games. Bluetooth Speaker that works with most mobile phones/devices. We are working on having a garden. This is a newly built home so garden will follow. Although Alaska supplies it's own greenery in abundance right outside the door. There are two decks. A large covered porch at front and an open grilling deck at back with BBQ Grill. Seating and table. Property sits on 2 acres. Very quiet, peaceful and private. We loved this cabin! It was our Honeymoon and could not have been more perfect! It had everything we needed. Seemed like it was in the middle of no where, which we loved, but had easy access to towns surrounding. Would definitely recommend and would definitely stay again! Thanks so much! Excellent cabin! Clean and in a very quiet location. My husband and I truly enjoyed our stay at the lake cabin. Look forward to it again ! Hi Alice ! So happy that you both enjoyed your stay and thank you for your wonderful review !! We hope you can make it back here again, it’s been a pleasure!! We loved the cabin! It was very cozy and private. The only thing I would suggest to the owners would be a more efficient water filter pitcher. The current one doesn’t hold very much at all, and filters painfully slowly, so we ended up buying water from the store. Other than that, it was a wonderful stay!!! I stayed at the cabin with 5 teenagers for 3 nights. I chose the cabin for easy access to ziplining at Matanuska Glacier and hiking at Hatcher Pass. The cabin is also only 15 minutes from Palmer which makes it very convenient for shopping and any extras you may have forgotten. The cabin is secluded in a quiet neighborhood near a lake. The kids enjoyed the space to roam a bit outdoors and the adults enjoyed the decks and BBQ grill. We had a larger group and the owners added a few foldaway beds and supplied plenty of linen for all of our group. Overall this was a great stay in a very clean cabin that accommodated all our needs. Thanks again for making our stay special. Better than other places in area. Cabin was excellently furnished and set up. After using other places for several years, this is my new place to book in the future. Access was easy and the area was beautiful. 5 minute walk to the lake and 20 minutes drive to Palmer. **Please Note** Checkout time no later than 11am and Check-in no earlier than 3pm. We require a minimum of three nights.